I found these cute little rocket popsicle molds at Dollar Tree. I got a set but didn't really look at them very hard until I got them home. They are small and 1 cup of liquid fills all 8 so I thought they would be good for small, cold treats like frozen smoothies. 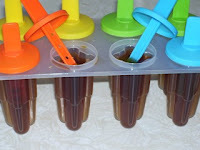 However, I noticed that the sticks were completely smooth and imagined that they would slide right out of the popsicles when frozen. I was right--6 out of 8 came out without their frozen treats attached. So I tried a little experiment. 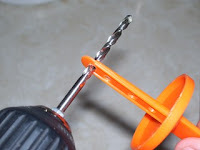 I drilled holes in the part of the stick that was put into the mold. I used as large a hole as I thought could work, structurally. Then I cleaned them up with a sharp knife, inserted in the hole and turned until the slivers of plastic came off. Then, I sterilized them. 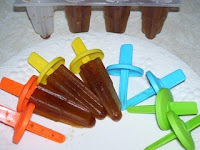 I only drilled out half of the sticks, then I made popsicles. When I tried to unmold them, not one of the plain sticks held its treat. However, 3 out of 4 drilled out sticks slid out properly. I did warm the outside of the mold in both cases. So, don't despair at poorly designed popsicle sticks. Get out power tools instead! Very clever -- our popsicle maker when we were young had the holes in it, so I'm guessing that's what yours should have been, and that's why it went to the dollar store! It was also cheap entertainment. I love to tinker with stuff and see what I can do with it. My kids roll their eyes when I get out the power tools.